In the framework of this K-Project the “Contactless Transmission Technology” part is intended to push the limits of existing RFID systems. 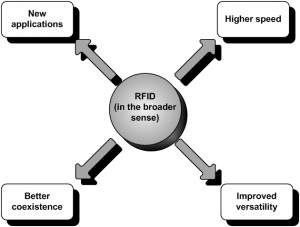 Despite the progress and improvements achieved in the RFID hardware in the recent years these systems are not applicable in several applications due to limitations imposed by the tag and the reader. Four different research activities are started to overcome these limitations and pave the way to new applications of the contactless transmission technology. On the one hand carrier frequencies beyond UHF will be explored, enabling significantly smaller tag sizes. Such micro-sized tags will allow the introduction of the RFID functionality in applications where the space is limited, for example, due to the design of the product. On the other hand the limits of locating and tracking of tags will be investigated. By evaluating a multi-input multi-output reading infrastructure and data fusion of hybrid localization algorithms the ability to detect a certain tag and track its movement will be improved. Operating several RF interfaces in close proximity often results in a performance degradation of some of these links. Setting guidelines for an improved coexistence of heterogeneous contactless transmission technologies is a goal within this project. Another research activity deals with transmitting high definition media over a near field radio interface. To enable high speed data transmission between devices in close distance is of significant importance for many applications dealing with HD media.